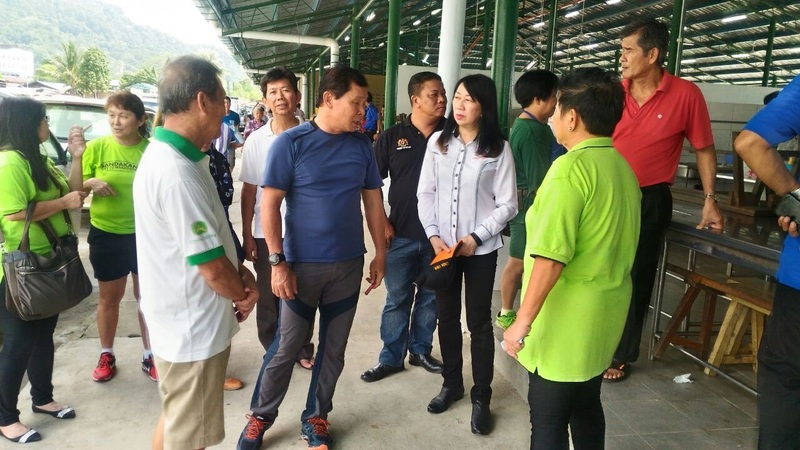 The Sabah Insider Online (Neutral And Flexible- Hot Spot News): The Sabah Insider Online…..MP BATU SAPI LINDA TSEN AND SMC PRESIDENT JAMES WONG VISIT AT THE TANAH MERAH MARKET. The Sabah Insider Online…..MP BATU SAPI LINDA TSEN AND SMC PRESIDENT JAMES WONG VISIT AT THE TANAH MERAH MARKET. SEKONG:- Batu Sapi Member of Parliament Datuk Linda Tsen Thau Lin and Sandakan Municipal Council president Datuk James Wong recently visited the new Tanah Merah Market in Jalan Leila. Both Linda and James met with hawkers to listen to the issues raised by them following their move from the old market more than a week ago. Among those present were Head Liaison Officer of Batu Sapi Member of Parliament Office Kong Nyuk Thou, and Sandakan Municipal Councilors. According to Datuk James Wong, the issues that were aired by the hawkers would be looked into while some of them had already been addressed. They spent nearly 30 minutes touring the new facility and meeting hawkers.